Asus is usually associated with quality, performance, reliability and of course high prices. Because the first nForce chipset was a 'relative flop', not many manufacturers were eager to adopt the nForce2. Asus was one of the few who bet on nVIDIA and because they did, Asus enjoyed almost exclusive rights to sell nForce2 for the first two months. Their motherboards simply flew off the shelves because of this. The A7N8X retails for $135 CDN ($100 US) and is a tad on the expensive side considering the board only has 5.1 audio and 10/100 LAN integrated. The layout of the A7N8X is excellent probably one of the best on the market. The IDE/Floppy and ATX power connectors are in their most ideal location to the right of the DIMM slots. There is nothing that will stop you from using the longer AGP/PCI devices. Even though AMD removed the four mounting holes adjacent to the CPU socket off their list of requirements, we were happy to see that Asus still included them on the A7N8X. Another little thing I really liked was how Asus places two fan headers just above the AGP slot. I'm not sure why, but there always seems to be a price premium on Asus products and here, we see that the A7N8X is about $30 CDN more expensive then a comparable MSI motherboard. Most other manufacturers these days tend to want to have "jumperless" motherboard but it seems that Asus is going backwards. Do we really need a CPU FSB selection jumpe? Couldn't that just be done in the BIOS? The A7N8X is decent overclocker for an A2 based nForce2 motherboard but it's certainly not the best that we have tested. 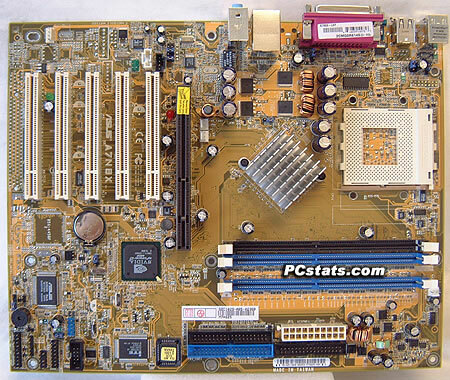 In terms of performance, the A7N8X was one of the faster motherboards. If you don't mind paying a bit more for the Asus "name" then the A7N8X is a good board. In a main system it would certainly serve any users well. Let's see what kind of opposition MSI can muster next.